In this article you will create a new Xamarin Android Left Navigation Drawer Layout. Step 1 - Open Visual Studio, New Project, Templates, Visual C#, Android, then click Blank App (Android). Then give Project Name and Project Location. Next we add V7 AppCompat References. Click Solution Explorer, Project Name, Components, then Right Click Get More Components to select, then popup window is visible. Search the Appcompat and then click to Add to App. Step 3 - Next create menu folder. Go to Solution Explorer, Project Name, Resources, Right Click Add New Folder give the name for menu. 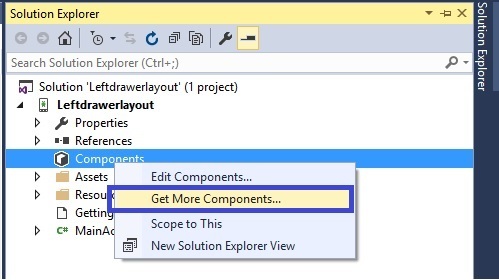 Step 4 - Next go to Solution Explorer, Project Name, Resources, menu, then Right Click Add New Item. Select XML and give the name for menu.xml. Step 5 - Create two xml for Colors and Styles. Select Solution Explorer, Project Name, Resources, values, then Right Click Add New Item. Select XML give the name for styles and colors. Step 10 - Next to open MainActivity.cs to give the following code.